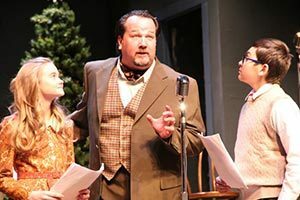 In “It’s A Wonderful Life: A Live Radio Play” playwright Joe Landry paid great homage to Frank Capra’s classic movie “It’s A Wonderful Life” from 1946. Joshua McGowen continues that by paying homage to Jimmy Stewart’s captivating performance in the beloved movie. Under director W. Jerome Stevenson’s thoughtful guidance, McGowen adopts Stewart’s distinctive speech pattern and mannerism, while making the character his own. 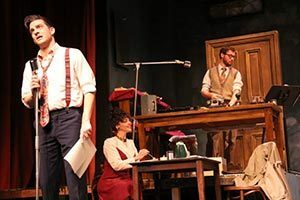 The radio play takes us back to a typical broadcast studio of the 1930’s and 40’s with actors and actresses assembled to read a play written specifically for radio broadcast. The Foley Artist in the corner creates all the sound effects. As the actors gather around their microphones, scripts in hand, the audience all over the country comes together in family and/or friend groups huddled before their radio sets to avidly listen. A Radio Play is somewhat like Reader’s Theatre, but the reality is they must not only memorize all their lines, they must memorize the page numbers! Nowadays it is a rare treat for a modern audience to be able to close their eyes and listen to the words and effects as our parents and grandparents did, as imaginations create our own blissful images. “It’s A Wonderful Life: A Radio Play” gives us that important opportunity in a way that revitalizes our spirit, inspires our brains to imagine scenes as beautiful as any movie but far more personal in nature. Those visualizations forever belong to us and they are uniquely lovely. While scripts are used, they soon become props, extending the gestures made. As the play progresses, the scripts begin to disappear, replaced with more expansive movement. The actors become the characters that they have created. McGowen’s tribute to Mr. Stewart continues throughout, but within that context his character, the well-known radio actor Jake Laurents becomes visible as he begins immersing himself within the words he speaks. Closing our eyes again we see the struggle of George Bailey, the man of great integrity who has given so much to others. We realize, along with him that the gift of his life to others is the gift God has given to him. The joy is his own, we forget Jimmy Stewart, we no longer see Jake Laurents, we no longer see Joshua McGowen, rather, we hear and visualize George Bailey, every man. George Bailey’s disappointments, like our own disappointments vanish in the joy of living. Kara Chapman is the beautiful and accomplished Sally Applewhite, comfortable in the spotlight. Applewhite is immediately ideal as Mary Bailey, loving wife and mother, determined to establish the best home for her family. The commodity Sally Applewhite deals in is integrity, but the overlay of Mary Bailey gradually takes hold and as she first becomes the girl, Mary Hatch and then becomes the woman, Mary Bailey. Mary Bailey’s character is full of love and honesty; her personal integrity is her foundation of love. It is a subtle yet powerful change; first felt with eyes closed, and Sally Applewhite is replaced with Mary Bailey. They are both lovely; yet as Mary Bailey’s presence becomes more dominant the solid and mighty strength of her foundation is exposed. David Fletcher-Hall is the veteran character actor, William Buckingham, completely confident in his performance abilities. As he takes on the aspect of Clarence, an angel struggling to earn his wings, that confidence in self is replaced by his utter faith in the Almighty. His chooses an unlikely method to save George Bailey, but it works, and we see his faith in God become also, an understanding of God’s faith in him. It is said that every time a bell rings, an angel gets his wings. Clarence Odbody is an angel with an angle, and the ring of his new wings becomes resounding peals of joy, echoing throughout the theatre with a softly encompassing effect. The play opens with James A. Hughes as Freddie Filmore, Announcer extraordinaire. Hughes explains the show, organizes the actors on stage and speaks directly to the audience. He does not play one single person, but a multiplicity of disparate individuals. He inflames our senses with Mr. Potter, the evil banker intent on making Bedford Falls his own private empire. Hughes is also other characters, among them a lifetime chum of George Bailey, as well several amazingly distinct roles, each one essential and recognizable. His transition from rogue to gentleman and back again is phenomenal. Timothy Stewart plays Harry Heywood, another character actor in numerous unique roles with a wide range of ages and personalities. He is the Italian with rapid-fire speech, then he becomes two of George Bailey’s important relatives, distracted Uncle Billy and brother/ hero Harry Bailey. Stewart creates these two family members similarly as they are Uncle and Nephew, but distinctly different with uniquely amazing eyes. His transitions are lightning fast and the changes are a marvel of timing. Kris Schinske Wolf is much like her character, Lana Sherwood. Lana Sherwood is a real trouper, a reliable and competent actress of stage and radio. Wolf gives Sherwood her seasoning respectfully and creatively. Her ability to gauge the tempo of her speech to each character Sherwood creates is phenomenal, from George Bailey’s mother, to the young adventurous Violet who is friend to all, her timing is superb. Wolf has a sensitive grasp of character development with expansive versatility. These three cast members, Hughes, Stewart and Wolf create the excitement in George Bailey’s life—all those people whose life he has affected so positively are rendered with wisdom, willfulness and wit. These characters set the stage that allows McGowen and Chapman to shine in their performances. Further, they add the tenderness that gives Fletcher-Hall’s character, Clarence, the understanding to approach Bailey as a savior. As a group these six actors exhibit the height of professionalism. Nevertheless, it is the kids who tear at our heart strings, and the four children who also play several characters have picked up the professional attitude of their adult colleagues. They have also absorbed the perspective a great sense of humor can impart to any performer on stage and off. Austin Barber is a young man with a certain future in any endeavor and absolute self-awareness, a most important trait in any successful actor. He is aptly chosen to play the young George Bailey as well as Tommy. Jaxon Pickens already understands the value of comedic timing and is not afraid to use it to advance any situation. Pickens shines as the boy, Harry Bailey as well as Pete. Barber and Pickens mirror with uncanny accuracy the closeness of the two brothers in adulthood. Rianna Stottemyre has already developed the grace in movement and the soft-spoken but projected voice that an actress finds invaluable. She is quite natural in her visualization of the young Mary with her child’s crush on George Bailey, clearly watching Chapman develop the grown Mary Bailey. Then she confounds us touching our hearts along with her father’s as Zuzu, the young daughter of George and Mary. Ruth Daigle is another star in the making as she gives us the young Violet as well as Janie, another of George and Mary’s daughters. She must have also watched her counterpart, Wolf, create the adult Violet, mirroring Wolf in a childish exuberant manner that gives both actresses the same secure foundation. Jared Blount is the Foley Artist, creating the sound effects on stage using various common devices to create running feet, the spoon scraping the bowl at dinner, and a door to slam or close as the script requires. Blount carefully observes the action of the actors in order to time the effects with the actor’s movement and speech. He does so with detail and flawless timing. His expression is schooled, but not distant and as he bridges the divide between actor and technical crewmember a greater understanding of the contribution made to any production is suddenly visible. Blount’s rapport with Stevenson as director is vital to the production. His connection to the Production Stage Manager, Hannah Finnegan and Stage Manager, Dakota Muckelrath reflects the importance of that bridge. This is a very valuable aspect of any production, but it is not one that is often seen or appreciated. All technical aspects of “It’s A Wonderful Life” are smoothly orchestrated making the complications of scene, lighting and sound design naturally invisible. Stevenson designs the lights while Hughes works alongside Michael James on the scene design. James creates his usual excellent and elegant period costumes. Stewart is responsible for authentic properties of the era and Blount designs the sounds off stage as well as on stage! Performing and designing go hand in hand in this production. “It’s a Wonderful Life: A Live Radio Play” is being performed through December 23, 2018 at the Pollard Theatre, 120 W Harrison, Guthrie, Oklahoma. For information and tickets, visit www.thepollard.org or the box office (boxoffice@thepollard.org. or call the telephone number 405-282-2800, Tuesday through Friday from 10:00 am to 5:00 pm. The curtain goes up at 8:00 pm, Thursday through Saturday with a 2:00 pm Sunday matinee. There are also two Saturday matinee’s available, on December 8 and 15, also with a 2:00 pm curtain. Stevenson’s brilliance in this production is as formidable as his cast is talented. “It’s a Wonderful Life” is a fabulous experience! Please note the review for this show published on Oklahoma Art Scene and Hurd by Adrienne Proctor. It is interesting to both writers to see the differences in focus for a production it is agreed is a superior presentation. Please feel free to comment on your thoughts. Note: Shorter reviews will shortly appear in an upcoming edition of The Oklahoman and posted here under Bonus Material. 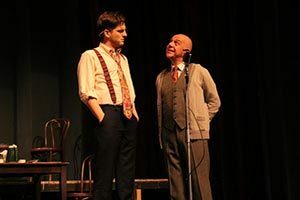 Foreground: Joshua McGowen and Timothy Stewart in “It’s A Wonderful Life: A Live Radio Play” Photo courtesy of The Pollard Theatre. Jerome Stevenson directs a fabulous cast taking various parts, with inspirational magnitude. The superb cast is led by Joshua McGowen as Jake Laurents playing George Bailey, and Kara Chapman as Sally Applewhite as the lovely Mary Bailey. David Fletcher-Hall is William Buckingham, perfectly portraying the somewhat bumbling angel, Clarence. Eleven players grace this marvelous production. The perfect Holiday entertainment for families, “It’s a Wonderful Life” is a simply fabulous experience! The Pollard Theatre presents for Christmas this year “It’s A Wonderful Life: A Live Radio Play” by Joe Landry. The stage play, done as a radio play, has actors clustered around microphones speaking the lines. Sound effects are carried out with realism, using common household items. In the radio era, families would gather around their receivers listening avidly, often with eyes closed, as the sounds and voices over the radio fired their imaginations. 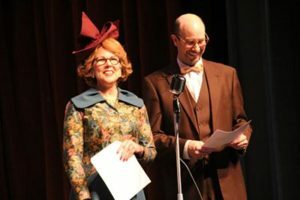 “It’s A Wonderful Life: A Live Radio Play” is presented exactly that way recreating old memories and new ones for the ‘youngsters’. 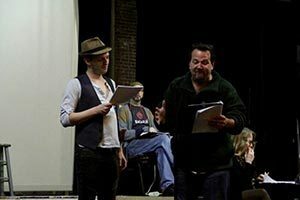 Jerome Stevenson directs a fabulous cast taking various parts, with inspirational brilliance. The superb cast is led by Joshua McGowen (as Jake Laurents) delightfully nostalgic interpretation of Jimmy Stewarts impressive George Bailey, and Kara Chapman (as Sally Applewhite) beautifully plays loyal Mary Bailey. David Fletcher-Hall is William Buckingham, perfectly portraying Clarence, the slightly bumbling angel. James A. Hughes opens the show as the energetic announcer, Freddie Filmore, following with excellent characterizations as numerous individuals. Kris Schinske Wolf is Lana Sherwood and her multitude of personalities reveal miraculous timing as she expresses many citizens of Bedford Falls. Timothy Stewart is exciting with his various identities, jumping from Italian rapid fire speech to Southern drawl with ease. The four children, Austin Barber, Jaxon Pickens, Rianna Stottemyer and Ruth Daigle are a captivating and talented crew stealing the hearts of every past radio listener and modern audience. The unsung hero is Jared Blount, Foley Artist, generating each effect with smooth timing. Stevenson’s brilliance in this production is formidable. “It’s a Wonderful Life” is a fabulous experience!